The Tuesday Tussle; the biggest illustrators squaring off against pop's biggest icons - icons you never thought they'd touch. 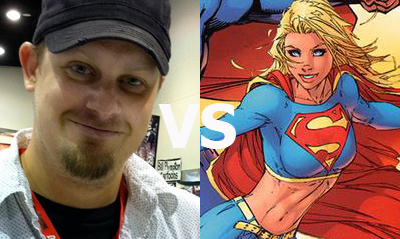 This week as part of 'Bright and light comics week', the man who brings illustrated fun to the game every time his pen touches paper, Skottie Young vs an icon from that other company he hardly touches, Supergirl. Fight! 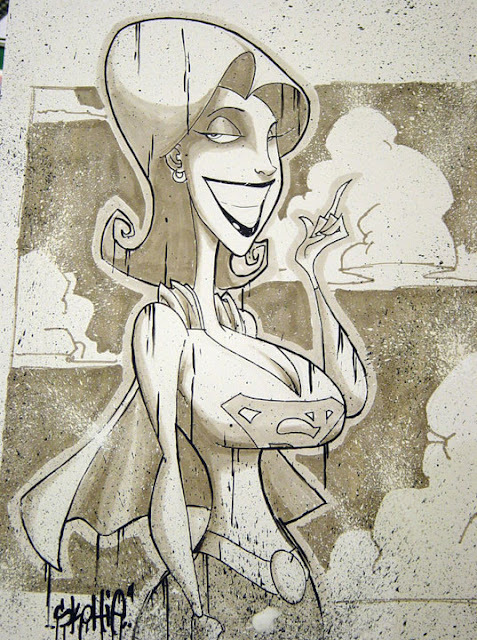 WINNER: Skottie How is it this guy can combine just the right parts of Martha Brady and Powergirl to pull off a damn decent Kara, yet other artists work just ends up looking like they've developed a cougar fetish from being trapped inside with a drawing board all day? While I'd kill (almost literally) to see his off beat take on The Doom Patrol, this shot again proves why his Marvel all-ages read OZ is stealing awards left and right. Humourous with bucket-loads of talent, you can see more of Skottie's art, on the man's own personal website, this one right here. I love Scott & Skottie's blog. They both do amazing work and don't just stick with comics. They do children's classics, they did those fantastic X-babies, Godzilla, and even did a whole series on the Muppets. He sure is a talented dude Craig! I first struck him on the short lived Human Torch series at Marvel, then one of Marvel's New Warriors revamps, and with each project he just keeps getting better. The video diaries on his own blog are pretty educational too! Oh reminds me! Back in the day I'd read somewhere that Paris was actually set to play SG in some new big-budget production or other. Fortunately (PRAISE THE MERCIFUL LORD IN HEAVEN AND ALL HIS SAINTS & ANGELS) nothing ever came of it. Thus was cinematic apocalypse averted! Whew! I'd second that Pensol. Wasn't Mariah Carey attached to her too at one point? Oh wait that was Wonder Woman. Until Ashley Judd gets to play Catwoman to me all other female casting choices are irrelevant anyway. Those two were made for each other. I'm not keen on this one, old Kara looks far too louche! Fun to see, though!